25% Dextrose Injection, USP is a sterile, nonpyrogenic, hypertonic solution of dextrose in water for injection administered by intravenous injection to restore blood glucose levels in hypoglycemia and as a source of carbohydrate calories. Each milliliter (mL) of fluid contains dextrose, hydrous, 250 mg which delivers 3.4 kcal/gram (0.85 kcal/mL). The solution has an osmolarity of 1.39 mOsmol/mL (calc.). pH is 4.5 (3.2 to 6.5). May contain hydrochloric acid and sodium hydroxide for pH adjustment. The solution contains no bacteriostat, antimicrobial agent or added buffer (except for pH adjustment) and is intended only for use as a single-dose injection. When smaller doses are required the unused portion should be discarded with the entire unit. 25% Dextrose Injection, USP is a dextrose (glucose) and nutrient (carbohydrate) replenisher. 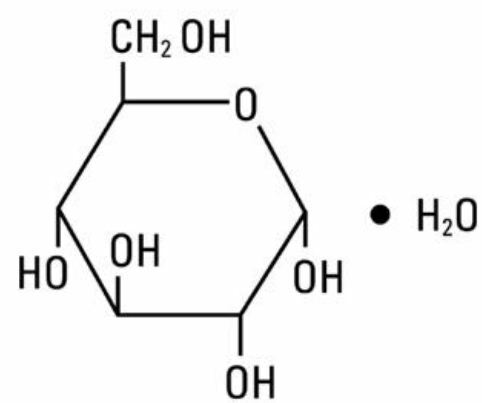 Dextrose, USP is chemically designated D-glucose monohydrate, (C6H12O6 H2O), a hexose sugar freely soluble in water. When administered intravenously, this solution restores blood glucose levels in hypoglycemia and provides a source of carbohydrate calories. Carbohydrate in the form of dextrose may aid in minimizing liver glycogen depletion and exerts a protein-sparing action. Dextrose injection undergoes oxidation to carbon dioxide and water. 25% Dextrose Injection, USP provides a concentrated solution sufficiently nonirritating for slow intravenous injection to infants for terminating acute symptomatic episodes of hypoglycemia in the neonate and in older infants (fasting blood glucose below 40 mg/100 mL). Values as low as 20 mg/100 mL are not uncommon in normal asymptomatic infants the first few days of life (longer in premature infants). Symptoms of hypoglycemia in the newborn and small infants may be difficult to evaluate and convulsions often are the first or only recognized manifestation of depressed blood glucose levels. Because of widely varied etiology, the precise cause may be difficult to establish. Hypoglycemia (deficient blood glucose) due to organic or functional hyperinsulinism, may be only temporarily abated by administration of dextrose (glucose) and may rebound to hypoglycemia levels as release of additional insulin is evoked. In addition to various other causes, an idiopathic form of hypoglycemia in infancy has been described, as well as occasional transitory hypoglycemia in the neonatal period which disappears in later infancy. Fetal hyperinsulinism in response to maternal hyperglycemia of diabetic mothers has been observed. Occasionally convulsions associated with severe hypoglycemia are observed in infants of diabetic mothers. Since glucose is the only sugar utilized for metabolic requirements of human neural tissue, it is essential to restore deficient blood glucose levels from any cause in order to prevent or correct central nervous system dysfunction. 25% Dextrose Injection is indicated in the treatment of acute symptomatic episodes of hypoglycemia in the neonate or older infant to restore depressed blood glucose levels and control symptoms. Other drugs, such as epinephrine and glucagon, should be considered in patients unresponsive or intolerant to dextrose (glucose). Oral feeding of dextrose may be necessary in infants with frequently recurring hypoglycemic episodes or to prevent recurrences due to hyperinsulinemia. 25% Dextrose Injection also provides a minimal source of carbohydrate calories. A concentrated dextrose solution should not be used when intracranial or intraspinal hemorrhage is present. 25% Dextrose Injection, USP is hypertonic and may cause phlebitis and thrombosis at the site of injection. Significant hyperglycemia and possible hyperosmolar syndrome may result from too rapid administration. The physician should be aware of the symptoms of hyperosmolar syndrome, such as loss of consciousness. Frequent monitoring of serum glucose concentrations is required when intravenous dextrose is given to pediatric patients, particularly neonates and low birth weight infants. Do not administer unless the solution is clear and seal is intact. Discard unused portion. Solutions containing dextrose should be used with caution in infants of diabetic mothers except as may be indicated in neonates who are hypoglycemic. Studies with 25% dextrose solutions in polypropylene syringes have not been performed to evaluate carcinogenic potential, mutagenic potential or effects on fertility. Reactions which may occur because of the solution or the technique of administration include febrile response, infection at the site of injection, venous thrombosis or phlebitis extending from the site of injection and extravasation. In the event of overdosage (hyperglycemia) during therapy, re-evaluate the patient and institute appropriate corrective measures. See WARNINGS and PRECAUTIONS. weight infants, because of the increased risk of hyperglycemia/ hypoglycemia. In the neonate, an injection of 250 to 500 mg (1 to 2 mL)/kg/dose (5 to 10 mL of 25% dextrose in a 5 kg infant) is recommended to control acute symptomatic hypoglycemia (tremors, convulsions,etc.). 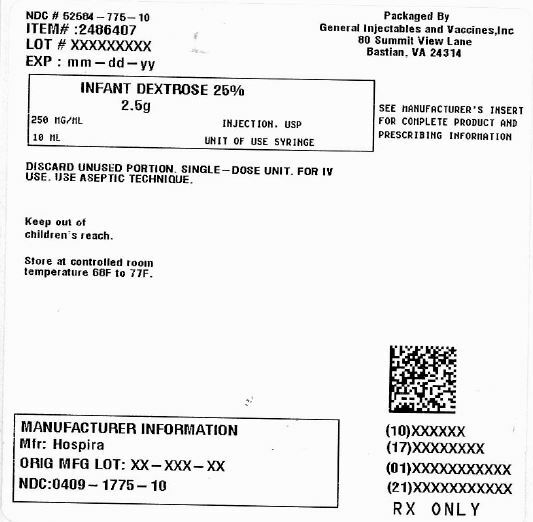 Larger or repeated single doses (up to 10 or 12 mL of 25% dextrose) may be required in severe cases or older infants. A specimen for blood glucose determination should be taken before injecting the dextrose. In such emergencies, dextrose should be administered promptly without awaiting pretreatment test results. Subsequent continuous intravenous infusion of 10% dextrose injection may be needed to stabilize blood glucose levels. Further treatment should be guided by evaluation of the underlying disorder. Parenteral drug products should be inspected visually for particulate matter and discoloration prior to administration, whenever solution and container permit. See PRECAUTIONS.